Contest is closed. Thanks for stopping by! In honor of the holiday weekend, I shared a post yesterday which features part of a “labor day” scene from The Cowboy’s Triple Surprise. 🙂 You can hit the back button above or click here to read the excerpt. I will be giving away print copies. Due to mailing and other legal restrictions, this is for physical addresses in the US and Canada only. Please do NOT put your mailing address in any comment. Winners’ names will be announced here at the blog on Sunday, September 9th, along with the details and deadline to respond. Please return to see if your name is listed. This giveaway is not sponsored by any social media platform. Shares of either or both posts on Facebook, Twitter, and your other social media are much appreciated but not required. and will be posted after they’re approved. Happy Labor Day Barbara.. I hope you are taking time for yourself today…Love all your books.. Thanks for writing so many good ones for your fans to read. Happy Labor Day! Hope you have been having a wonderful holiday weekend! Thank you, Colleen, and the same to you! We’ve been having a great relaxing time here. Happy Labor Day Barbara you write awesome books. Happy Labor Day! Thanks for the chance. Thanks for the kind words, Donamae, and Happy Labor Day to you, too! No worries about your other comments, I did receive them, also. We have comments set to need approval before they go live, to eliminate spam. The same to you, Linda! And you’re very welcome! I love the short 🙂 thanks for the chance. My kind of book! 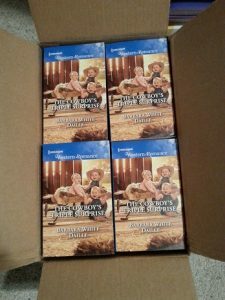 Cowboys, print book, babies, sweet romance, and Barbara White Daille! 😉 HappyLabor Day! Aww-w-w, Cindy – thanks so much! 🙂 And Happy Labor Day to you, too. Hi, Cindy – Happy Labor Day to you, too! Thanks again for your kind words about The Cowboy’s Triple Surprise! Looks like an interesting book to read and I would love to win a print edition. Love all of your books! Can’t wait to get my hands on this one! It’s the day after Labor Day. Hope that’s okay. Your excerpt hooked me. I’d love to read the rest of the story as Paul Harvey used to say. Sounds like a cute read. The cover is adorable! Looks like a great book. I am looking forward to reading it. Hope you had a nice Labor Day! And our Labor Day was great – nice and relaxing. Hope yours was, too. I’m late to this party! I just saw it on my FB feed a week late? Gotta love FB. This looks like a super book. Can’t wait to read it. Thanks so much for the kind words about the book! As for FB, I so agree. Triplets !! Would love to read and review this book. My birthday is labor day weekend,so this would be a nice surprise. Thank you for the chance. Hi, Rosemary – you’re very welcome. Hope you had a wonderful birthday! Thanks so much, Robin – and you’re very welcome! The Cowboy’s Triple Surprise sounds wonderful. Thank you for the opportunity to win. Emma – my pleasure. And thank YOU for the compliment about the book. This sounds really good. Hope you have a wonderful weekend. Thank you for the chance. I love the cover! Thank you, Mary – and the same to you! I was three times lucky with that cover, wasn’t I, Nancy? 😉 Thanks! I’m so glad to hear that, Stacey! Thanks for sharing it. Kathleen – thanks so much for all your kind words. I really appreciate the support and am so thrilled you enjoy the books!